In this paper, Microsoft offers a simplified approach for determining the ROI of an IoT investment, using an example of a firm implementing a remote monitoring solution. It starts with defining a business objective and comparing basic implementation costs to potential long-term savings. It then outlines other considerations, such as evaluating the less obvious costs and unexpected benefits of an IoT solution. This document is intended for IT professionals, system architects, and developers who are interested in understanding how Azure AD B2C help managing identities for their consumer-facing application in their (hybrid) cloud environment and how to leverage the related features. Azure AD can be truly seen as an Identity Management as a Service (IdMaaS) cloud multi-tenant service. This document is intended for IT professionals, system architects, and developers who are interested in understanding the various options for managing and using identities in their (hybrid) cloud environment based on the Azure AD offerings and how to leverage their related capabilities. Azure Stack is an extension of Azure, bringing the agility and fast-paced innovation of cloud computing to on-premises environments. Organizations can now build modern applications across hybrid cloud environments, balancing the right amount of flexibility and control. Developers can build applications using a consistent set of Azure services and DevOps processes and tools, then collaborate with operations to deploy to the location that best meets the business, technical, and regulatory requirements. Download this white paper to learn more about how you can extend Azure Stack to make Azure services available on-premises. This guide is intended for enterprise IT architects and executives. 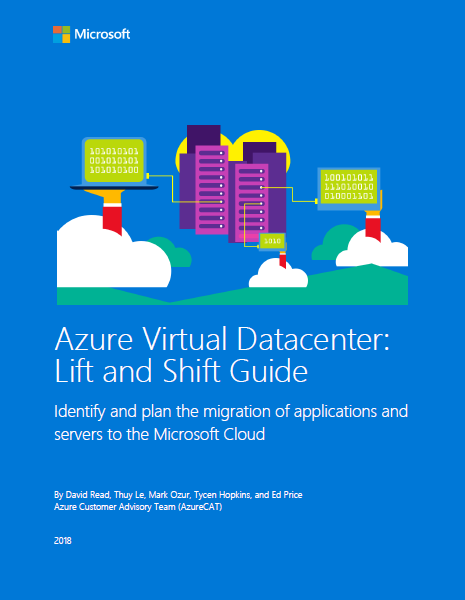 Using the lens of the physical datacenter, the guide discusses an approach to designing secure, trusted virtual datacenters on the Azure platform. Azure Virtual Datacenter is not a specific product or service but rather a way to think about cloud infrastructures. It offers proven practices and guidance to help smooth your migration to the cloud. At the end of this guide, you can learn about the upcoming Virtual Datacenter Automation guidance. This guidance includes a collection of scripts and Azure Resource Manager templates that will help you build an Azure Virtual Datacenter using the trusted extension model. The new Microsoft Azure Data Lake services for analytics in the cloud (bit.ly/1VcCkaH) includes a hyper-scale repository; a new analytics service built on YARN (bit.ly/1iS8xvP) that lets data developers and data scientists analyze all data; and HDInsight (bit.ly/1KFywqg), a fully managed Hadoop, Spark, Storm and HBase service. Azure Data Lake Analytics also includes U-SQL, a language that unifies the benefits of SQL with the expressive power of your own code. The U-SQL scalable distributed query capability enables you to efficiently analyze data in the store and across relational stores such as Azure SQL Database. In this article, I’ll outline the motivation for U-SQL, some of the inspiration and design philosophy behind the language and give a few examples of the major aspects of the language. Sometimes mission critical systems may have higher SLA requirements than those offered by the cloud platform services. It is possible to build systems whose availability is higher than the constituent services by incorporating necessary measures into the system architecture. Airplanes, satellites, nuclear reactors, oil refineries and other mission critical real world systems have been building highly available architectures from components that are prone to fail. These systems employ a varying degree of redundancy based on the tolerance for failure. For instance, Space Shuttle2 used 4 active redundant flight control computers with the fifth one on standby reduced functionality mode. Through proper parallel architecture for redundancy, software systems can attain the necessary reliability on general purpose cloud platforms like Windows Azure. The SLA numbers used in this document are theoretical possibilities and the real SLA numbers depend on the quality of the application architecture and the operational excellence of the deployment. This document discusses how to realize a continuous deployment pipeline using Microsoft Azure Web Sites. To successfully implement such an approach, deployment is the last step of the full delivery pipeline, which consists of configuration management, continuous integration, automated testing, and automated deployment. Customers are looking for a mainframe alternative capable of delivering equivalent functionality and features without the drawbacks and costs. This paper, by Larry Mead of the AzureCAT team, covers the major IBM z/OS mainframe components alongside their Azure equivalents and is designed to help you complete the critical first step of moving to the cloud. It also provides a road map for starting the conversation with IT decision-makers who subscribe to outdated mainframe philosophies. Updated November 2016. HIPAA and the HITECH Act are United States laws that apply to most doctors’ offices, hospitals, health insurance companies, and other companies involved in the healthcare industry that may have access to patient information (called Protected Health Information, or PHI). In many circumstances, for a covered healthcare company to use a service such as Microsoft Azure, the service provider must agree in a written agreement to adhere to certain security and privacy provisions set out in HIPAA and the HITECH Act. This guide was developed to assist customers interested in HIPAA and the HITECH Act to understand the relevant capabilities of Microsoft Azure. The intended audience for this guide includes privacy officers, security officers, compliance officers, and others in customer organizations responsible for HIPAA and HITECH Act implementation and compliance. While Microsoft Azure includes features to help enable customers’ privacy and security compliance, customers are responsible for ensuring their particular use of Azure complies with HIPAA, the HITECH Act, and other applicable laws and regulations. This paper outlines the end-to-end platform and tools from Microsoft that form the critical capabilities for organizations planning and developing mobile enterprise apps for Windows, iOS and Android connected to backend services (Cloud and on-premises). The hybrid cloud environment disrupts IT with undefined roles, responsibilities, and activities. IT teams are challenged to adopt and realize rapid value from the cloud. Organizations must move to modern service management practices, including Agile and DevOps, and accelerate digital transformation. Microsoft Modern Service Management takes a value-based approach to service management that helps organizations maximize their Microsoft Cloud investment. See how Microsoft Modern Service Management can help you modernize your IT practices. Microsoft Modern Service Management is not a new framework, a set of books, or intellectual property. It's an evolved perspective that can be stated as: "A lens, intended to focus ITSM experts around the globe on the most important outcomes that evolve our customers from earlier, traditional IT models, toward easier, more efficient, cost effective, and agile service structures." Microsoft is committed to ensuring that your data remains your data, without exception. When stored in Microsoft Azure, data benefits from multiple layers of security and governance technologies, operational practices, and compliance policies in order to enforce data privacy and integrity at a very granular level. This white paper describes such capabilities in Microsoft Azure, including mechanisms for encryption, secrets administration, and access control that you can leverage for managing sensitive data. The sections that follow provide detailed guidance on how to use features in the Microsoft Azure platform to protect critical enterprise data in the cloud, whether structured or unstructured, in-transit, or at-rest. Azure Site Recovery is the suggested solution for SAP DR on Azure. This document describes how to implement and test SAP NetWeaver DR using Azure Site Recovery. Azure DocumentDB is Microsoft’s multi-tenant distributed database service for managing JSON documents at Internet scale. DocumentDB is now generally available to Azure developers. In this paper, we describe the DocumentDB indexing subsystem. DocumentDB indexing enables automatic indexing of documents without requiring a schema or secondary indices. Uniquely, DocumentDB provides real-time consistent queries in the face of very high rates of document updates. As a multi-tenant service, DocumentDB is designed to operate within extremely frugal resource budgets while providing predictable performance and robust resource isolation to its tenants. This paper describes the DocumentDB capabilities, including document representation, query language, document indexing approach, core index support, and early production experiences. This paper reexamines the requirements for a blockchain network in the context of a confidential consortium. It then introduces the Coco Framework, including network topology and system architecture, network creation and governance, transaction flow, and architectural variations. It also examines how scalability, confidentiality, and distributed governance are achieved, along with security considerations and how security risk can be mitigated. Finally, it discusses the current working implementation of Coco, including initial performance findings. Alle Services in der Microsoft Azure Plattform kompakt erklärt in diesem Überblicksdokument.